There’s always something going on at the York Expo Center. © 2011 by The York Dispatch. 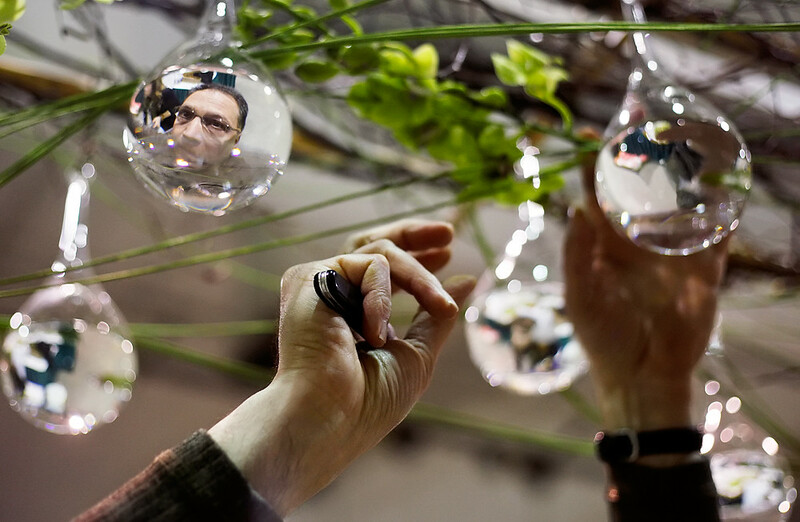 Florist Vince Butera's face is reflected in water-filled glass bulbs suspended from the birch-branch canopy of his booth's wedding pergola as he inserts Thai orchids into holes in the bulbs, on Wednesday, March 2, 2011. When completed, the pergola will feature the orchids from Thailand as well as roses from Ecuador, lilies from Pennsylvania and ranunculus from Holland. The annual Pennsylvania Garden Show of York, which opened at the Toyota Center on Thursday, March 3, featured 120 vendors in display gardens, building products, specialty designs and home improvement. This year's theme was "Romantic Garden." © 2011 by The York Dispatch. 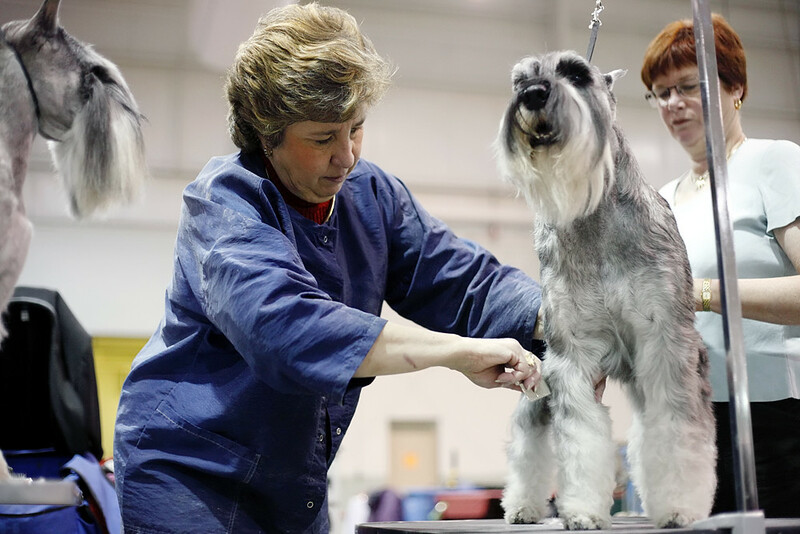 Diamond, a Standard Schnauzer, watches as her half-brother Schweitzer is groomed by her owner Carol Filer of Altoona and held still by Brenda Kibler of Monkton, Md., on the first day of the Celtic Classic dog show at the Toyota Arena on Wednesday, March 16, 2011. The annual Celtic Classic dog show opened at the Toyota Arena and Memorial Hall West on Wednesday, March 16, 2011. Featuring dogs from the York, Lancaster and Delaware Kennel Clubs, the show ran through Sunday, March 20, at the York Expo Center. © 2011 by The York Dispatch. A train rushes past several people and their parked cars on part of the model set built by the Susquehanna Valley Garden Railroad Society for the East Coast Large Scale Train Show in Memorial Hall at the York Expo Center on Thursday, March 24, 2011. The East Coast Large Scale Train Show's spring show is open 9 a.m. - 6 p.m. on Friday, March 25, and 9 a.m. - 4 p.m. on Saturday, March 26, at Memorial Hall in the York Expo Center. 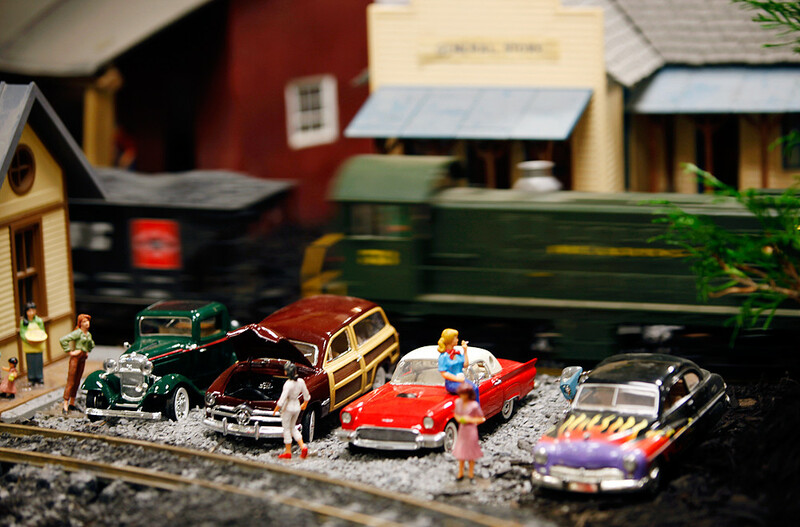 Featuring dozens of vendors selling everything from tracks to miniature shrubbery to trains, the show also is host to several clubs and societies that have constructed railroad models in the halls.